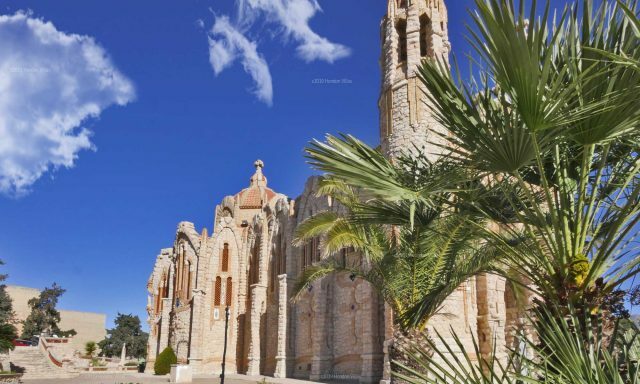 The Sanctuary of Santa María Magdalena is a beautiful ornate Catholic Church located in just outside Novelda Town (near Alicante), Valencia, Spain. It was built from a project designed by the novel engineer José Sala Sala, 1 2 with a certain inspiration in the modernist style of Antonio Gaudí. Later the construction was executed by the masters of works Noveldenses Ceferí Escolano and Antoni Amorós. It is a very unique and outstanding work within Valencian modernism. The building bears a distant resemblance to the Sagrada Familia of Barcelona by Antonio Gaudí. It has a jug shape, symbolizing the jug that the Saint brought as a balm to Jesus. This original form is also unique in the world. On the main façade there are two 25 m lateral towers. of height culminated by a stony cross, which is also found in the dome and on the upper arches of the façade. Decorative motifs have antecedents in the medieval, baroque styles and in nature itself. These influences led the author to combine pebbles from the Vinalopó River, polychrome tiles, red bricks, masonry, etc., which are reflected throughout the exterior of the building. The interior of the sanctuary is composed of a rectangular central nave with two attached side spaces; At the end, in the apse, is the dressing room of Santa María Magdalena, patron saint of Novelda, and behind the altar you can admire a beautiful painting attributed to Gastón Castelló. Since the late twentieth century is planned and is proceeding slowly to the incorporation of an organ built entirely in marble, work of the innovative organ maker and artist Ivan Larrea, who will become the only one in the world with these characteristics. The Sanctuary of Santa María Magdalena of Novelda is the place that many couples choose to get married and baptize their children. It is a place with a lot of history for the Noveldens since here the election of grapes that will accompany Santa María Magdalena in the procession of July 22, day of the patron saint is also celebrated. It is also interesting to note that, for several years, they lived in a building next to the Sanctuary, the Dominican Sisters. Three years ago they went to another region of Spain. In the place where they lived, a hostel and a thematic centre are being set up.